You can create multiple membership levels, each with different membership fees, subscription periods, renewals policies, and benefits. Membership levels define and distinguish different types of members. Assigning a membership level to a contact makes the contact a member. A member can only be assigned to one membership level at a time. 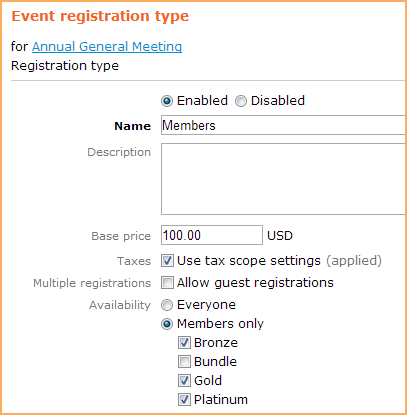 You can limit access to pages, events, event registration types, and custom membership fields by membership levels. Inclusion in a member directory can also be restricted by membership level. As well, you can choose recipients for event announcements using membership levels. The summary view of your member list is grouped by membership level. There are two types of membership levels: individual and bundle. Individual membership levels allow people to join by themselves. You can set up any number of individual levels with different membership fees, subscription periods, renewals policies, and benefits. For information on setting up individual membership levels, see below. A bundle membership level allows multiple people to join your organization as a group. Bundles members share the same status, renewal date, status, and membership level. Bundles can be used to offer a discounted group membership to companies, teams, or families. For information on setting up bundle membership levels, see Membership bundles. To allow visitors to your site to join your organization, you must set up one or more membership levels. Hover over the Members menu and click the Levels option. From the membership level list, click Add level. Enter the name of the membership level (e.g. Gold) in the Name field. Do not use a name that includes the < symbol. It may interfere with online payment processing. Enter a membership fee and choose whether to apply your tax settings to the fee. Enter a description for the level. The description will appear below the membership level details on the membership application form. Click the Renewal policy tab and decide on your membership renewal policy. Click the New applications tab and decide how you want to handle new applications. Click Save to finish creating the membership level and add it to the membership level list. 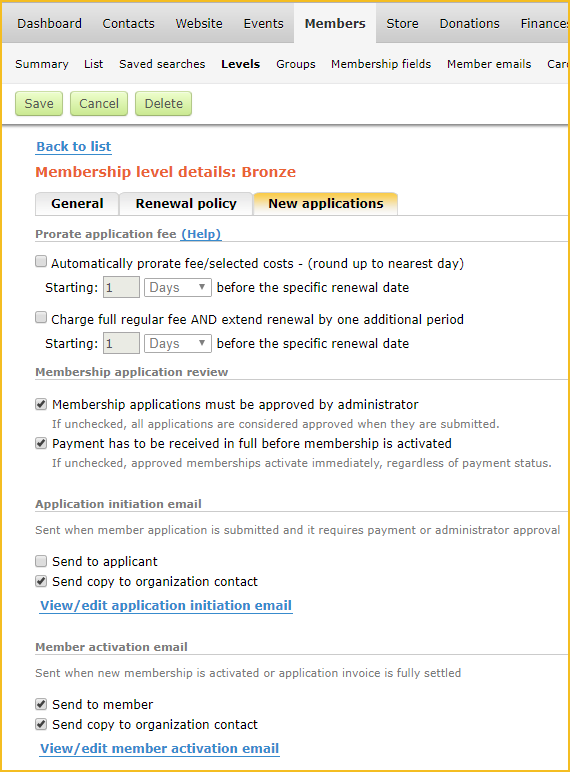 To modify an existing membership level, click the level within the list. On the General tab, you can enter the following information about the membership level. The name used the identify the membership level (e.g. Gold). Do not include angle brackets ( < or > ) in the level name as these can interfere with payment processing. Indicates whether this is an individual or bundle level. For information on bundle membership levels, see Membership bundles. The cost of the membership to be applied according to the renewal policy. For free memberships, enter a value of 0. Choose whether to apply your tax settings to the membership fee. Choose whether to accept online and/or online payments for this level. Depending on which payment method option you choose, different payment workflows will take place after the applicant completed the membership application form. If only offline payment is enabled, then the applicant will have the option of canceling or confirming the application. If the applicant clicks the Confirm button, an invoice will be emailed to them, and a membership application summary will be displayed. From the application summary, the applicant can choose to view or pay the outstanding invoice. If only online payment is enabled, then a Pay online button will appear. Clicking the Pay online button will take the applicant to the online payment screen for your site's payment provider, where they can pay the membership fee. The fee will not be adjusted to take into consideration any credits or other outstanding invoices. The description that appears below the membership level details on the membership application form. Controls whether visitors to your site can apply for this membership level. Disable this option if you only want to manually assign members to this level. Controls whether members can switch from this to a different membership level. 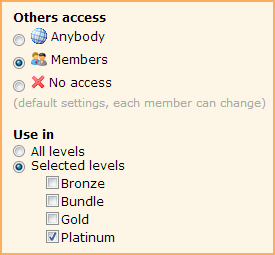 If you enable this option, you then choose the levels that members can switch to. For more information, see Renewing memberships or changing levels. Members who switch levels will be billed the full membership fee for the new level. All refunds must be done manually. From the Renewal policy tab, you choose the renewal period and the date of renewal, and decide on your membership renewal approach. Memberships will be automatically renewed and the membership fee automatically paid. Members will receive an email confirmation but won't be required to do anything. Configure your payment settings to support recurring payments. Check the Enabled option under Automatic recurring payments. Automatically generate membership renewal invoices and email to members a specific number of days before their renewal date. Members can click the email link and pay the fee and immediately renew their membership without even having to log in. Under Renewal reminders and actions, check the Generate and email invoice option. Check the option to send the renewal reminder email to the member and/or the organization contact. Members will receive pending renewal notices, but the onus is on them to log in to the site and renew their membership. Check the option to send a renewal reminder email to the member on or x days before the renewal date. If optional extra charges are included in membership renewals, you might want members to renew their memberships themselves – without receiving automatically generated invoices – so that they can decide whether they wish to pay for the optional extras. 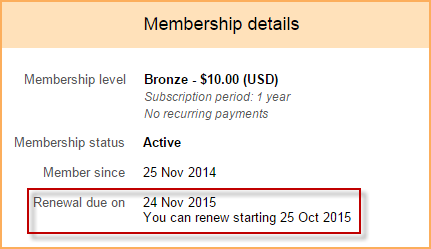 In the Renewal period section, you choose when memberships at this level come up for renewal. First, you choose the renewal interval – monthly, quarterly, twice a year, every x years, or never – then you choose the actual date of renewal. The renewal date can be set to the date the member joins (join date), or a specific day of the month (e.g. 1st or 15th). You can set up recurring payments so that memberships can be automatically renewed on a regular schedule. You can limit renewals to a single renewal period ahead, and control when members can renew. If you check the Limit renewal to 1 period ahead option, then members cannot renew an infinite number of periods into the future. With this option enabled, you can also choose to limit renewals to a certain number of days or months before the membership expires. These options are only available after you select a renewal period (above). Renewal reminders and actions take place before the membership is renewed. Renewal notifications are sent once the membership is renewed. A membership renewal notice and invoice will be emailed to active members who have not yet renewed. Depending on your routing settings, a copy of the email may also be sent to one or more administrators. 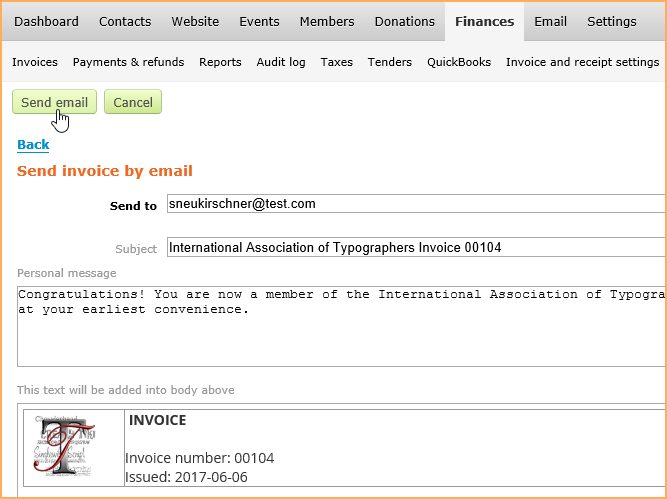 If the member clicks the View invoice online link within the emailed invoice, they will be able to view and pay the invoice online without logging in. If you remove the View invoice online link from the default invoice template, it will not be automatically added to your email. 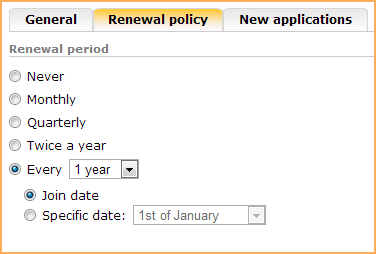 Once this option is enabled, the renewal invoice will be emailed regardless of the settings on Invoice settings screen. This option is not available for levels with automatic recurring payments. You can choose to send a separate reminder email to the member and/or organization contact. To modify the reminder email, click the renewal reminder email 1 link. You can choose to send the reminder email to the member and/or organization contact. To modify the reminder email, click the renewal reminder email 2 link. You can choose to send the renewal day email notice to the member and/or organization contact. To modify the renewal day email notice, click the renewal day email notice link. Renewal period for the member will be changed to Never. The member will no longer receive any more renewal notices. Typically, you would use this option together with the Change membership level option below to move a member who does not renew to a lower or inactive membership level. Grace period email notice will be sent to the member and/or organization contact. To modify the grace period email notice, click the grace period email notice link. Membership renewal invoice will be automatically voided for members with a status of Pending - Renewal if not fully paid within the specified number of days following the renewal date. The invoice will be voice whether generated automatically or manually. When you enable this option, the Change status to lapsed option is automatically enabled as well. Membership status of the member will be changed to Lapsed. A lapsed member will no longer receive automatic renewal notices, will no longer appear in member directories, and will no longer be allowed to view member only pages, add comments to blog pages, or post or reply to forum topics. For more information, see Contact and member statuses. A lapsed member can restore their membership by paying the renewal fee. Archive the member's record. Archived members will no longer receive email blasts (including event announcements) or renewal notices. Lapsed email notice will be sent to the member and/or organization contact. To modify the grace period email notice, click the lapsed email notice link. From the New applications tab, you decide how you want to handle new applications. You can provide for various emails to be sent and actions to take place when someone submits a membership application. In some cases, you may want to review the application first to see if it meets certain minimum requirements. If you want applications to be automatically approved and activated, disable the Membership applications must be approved by administrator option. You also have the option to automatically approve and activate the membership before payment is received in full. If you choose to require administrator approval and/or receipt of payment, then applications will remain in Pending - New status until the application is approved and/or payment is received in full. For membership levels that use a specific renewal date – rather than the join date – you can prorate or adjust the membership fee when members join part-way through the membership period. Instead of charging members the full membership fee for an abbreviated membership period, you can choose to pro-rate the membership fee or charge the full fee and extend the membership into the next renewal period. For example, if your annual membership fee is $120 and your memberships renew on January 1st, and someone joins on June 10th, Wild Apricot can automatically adjust their membership fee to $70. Alternately, you choose to charge the full fee and extend the membership through to the end of the next year. For more information, see Prorating membership dues for new applications. To delete a membership level, click it within the membership level list then click the Delete button. You will be prompted to confirm your intention to delete the level. You cannot delete a membership level if members are currently assigned to it. Also, you cannot delete a membership level if it is the last remaining level set up for your site. To assign a contact to a membership level, go to their contact record and click the Membership tab. 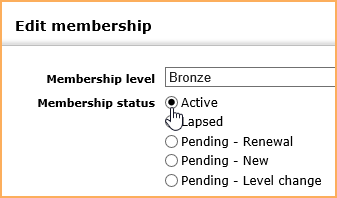 Within the Membership tab, click the Assign membership button then select a level from the Membership level list. After you save your changes, you will be given the choice of generating an invoice or activating the membership without generating an invoice. ...and include a message in the email informing the member of their new status and the outstanding membership fee. If you've already received payment, you can click the Record payment button from the Membership tab – after generating and saving the invoice – to record the payment. Once you've recorded the payment – or activated the membership without payment – the member activation email will be sent. If you want to activate the membership without payment, and without sending an activation email, you can click the Edit button on the Membership tab and change the Membership status to Active. 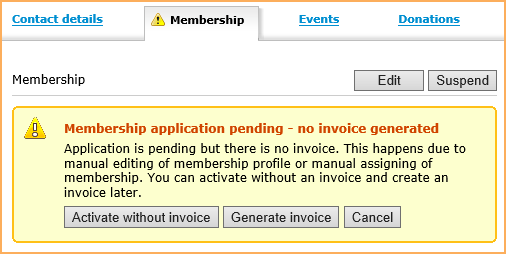 You will continue to be alerted to the outstanding invoice, unless you void or delete the membership invoice. You can also use this approach to switch an existing member to a different membership level. Members will be billed the full membership fee for the new level. The next renewal date will be calculated based on new level settings. To change membership levels for multiple members at the same time, you can export your contact records to a spreadsheet, change the levels within the spreadsheet, then import the revised spreadsheet into Wild Apricot. For more information, see Bulk changes using import and export. If you enabled the Member can change to option on the General tab for their current membership level, members can switch to a different membership level from their member profile. Members who switch levels will be billed the full membership fee for the new level. The next renewal date will be calculated based on new level settings and payment date. 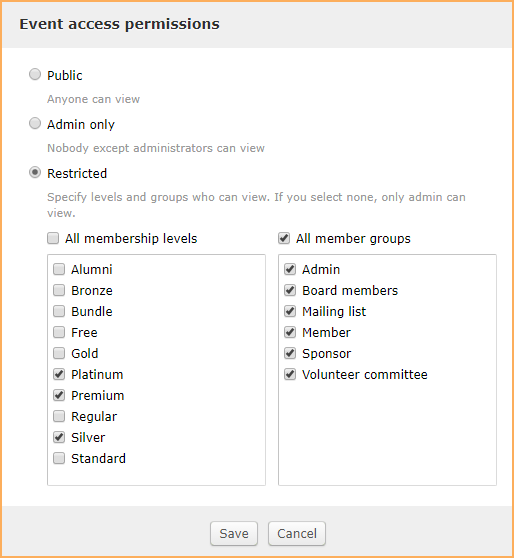 You can limit access to pages, events, event registration types, and custom membership fields by membership levels. Inclusion in a member directory can also be restricted by membership level. You can restrict page access to selected membership levels so that only members at those levels can view the page, either through the site menu or via a direct link (URL). 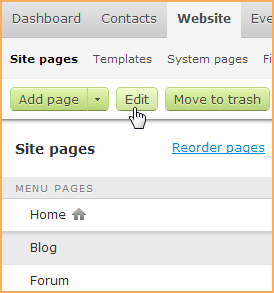 Hover over the Website menu and click the Site pages option that appears. Within the site page list, click the page that you want to restrict access to. If the page you want to select is grouped under another page, you may have to click the plus sign beside the parent page to display its subpages. Within the Access level options that appear in the page settings on the left, click the Restricted option. Choose the member levels – and optionally, membership groups – that can view the page. If you restrict access by both membership levels and membership groups, then members who belong to any of the selected levels or groups will be able to access the page. If you check the All levels or All groups option then all levels or groups – including any levels or groups added in the future – will be selected. For more information, see Page access and visibility. Within the event details, click the Admin only or Public link towards the top. Within the dialog that appears, click the Restricted option. Check each of the membership levels – and optionally, membership groups – you want to grant access to. Click Save to save the changes to your event. Click the registration type you want to restrict. Under Availability, click Members only and check the membership levels you want to limit this event registration type to. You can control whether the membership fields you create will apply to all membership levels or just to the ones you select. 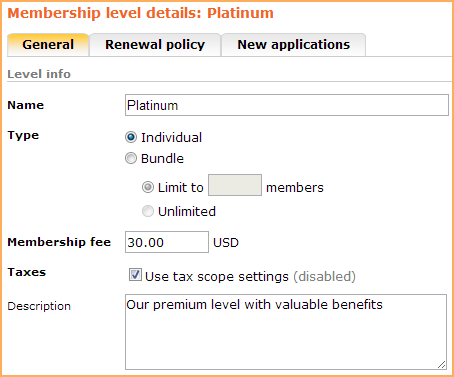 Hover over the Members menu and select the Membership fields option. Click the field you want to restrict. Under Use in, click Selected levels then check the membership levels you want to limit this field to. 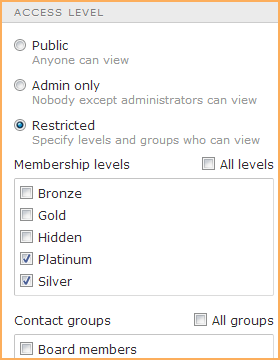 You can limit a member directory to displaying only members at selected membership levels. Begin editing the page where the member directory appears. Hover over the member directory gadget and click the Settings icon. Within the gadget settings panel on the left, choose from the following options under Members to include. Restrict the list to members at selected membership levels. 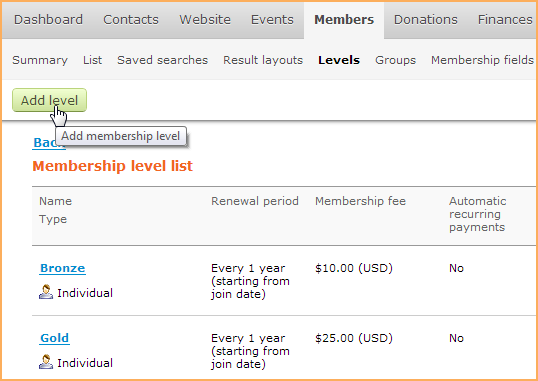 When you click this option, you can choose one or more membership levels to be included in the directory. Indicates whether to include only bundle administrators and exclude individual members of bundles. The profiles of individual bundle members will still be accessible from the bundle administrator's profile even if individual members are excluded. Whether a member appears in the directory also depends on that member's privacy settings.